Charlotte’s first birthday party had a rainbow theme, but her party was, well, about 4 months ago. This post should have went live months ago, but here it is now, in all its glory! 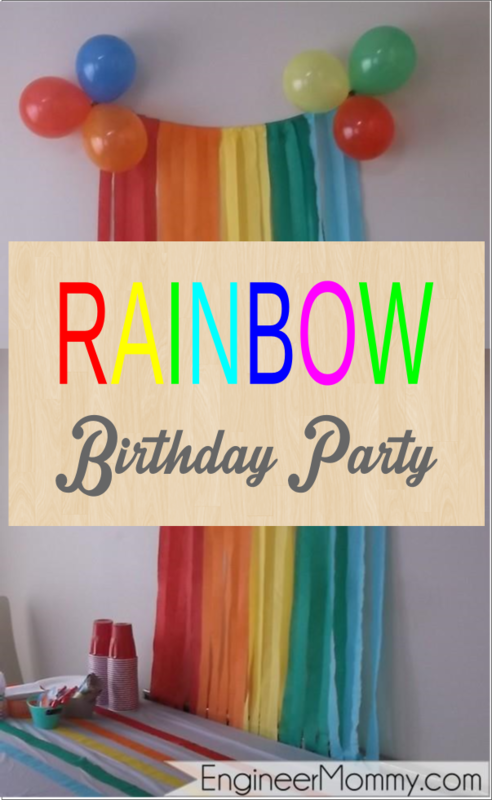 There are so many ways to bring a rainbow party theme into your décor and tablescape, and it’s a lovely theme idea for children’s birthdays. I did it and I figured out what worked and what didn’t. So I’ll share my findings here! Insert two nails into the wall and hang a thin string across the span between the nails, allowing the string to drape downward. 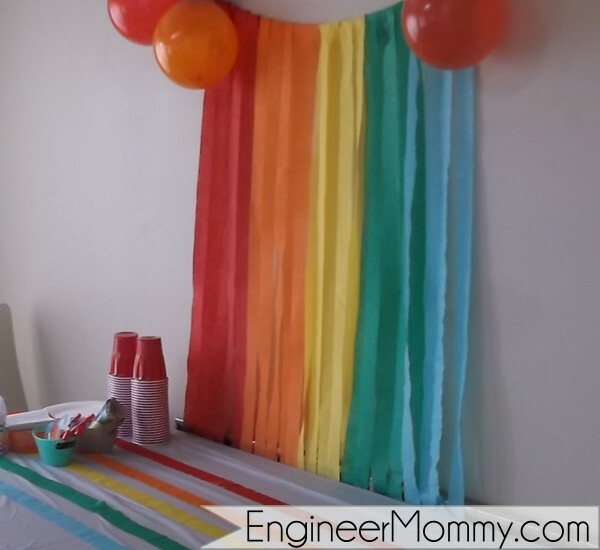 Make big bold strips of color hanging down by affixing paper streamers to the string. Do the rainbow colors- red, orange, yellow, green, blue, indigo and violet. I didn’t have a few of them so I just left them out, without altering the effect. Hang about 3 or 4 strips of crepe paper streamers all the way down from the string past the table. Fold over the streamer at the string and tape the edge down. 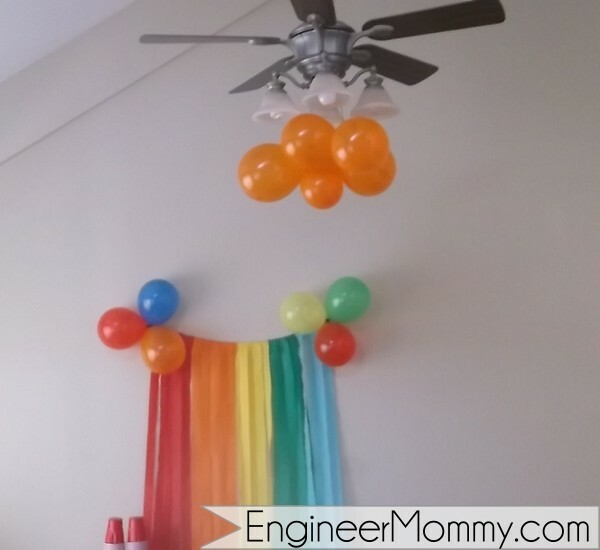 Blow up a few balloons in various rainbow colors and then attach them in small groups of three or four to the nails in the wall. Use a white tablecloth! You may think a colorful, or even rainbow, tablecloth is fitting, but it would be color overload and make the scene too busy. A white tablecloth is a classy, neutral backdrop to allow your rainbow colors to pop! Line your table lengthwise with the same crepe paper streamers you used on the wall- in the same order. Simply lay them on top of the tablecloth and the effect will be a rainbow runner! You can use solid primary color cups and plates, or use rainbow ones. Your choice! I prefer solid colors here, so the intentional pops of rainbow really stand out! We also placed a handful of balloons in other various places around the room. 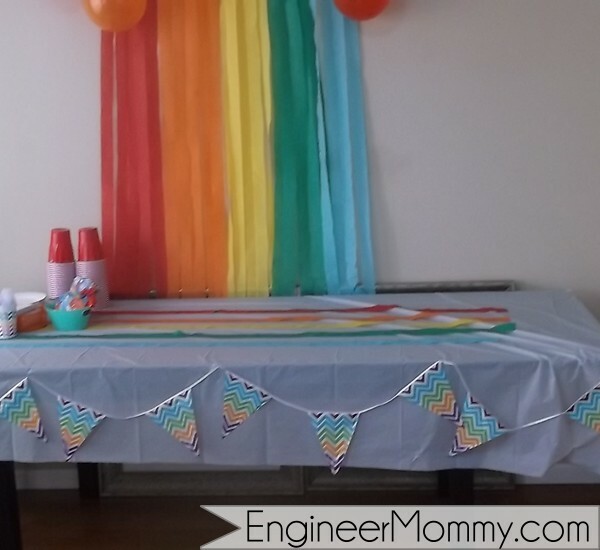 We found this rainbow chevron bunting banner at…(wait for it)…. Dollar Tree! Can you believe that? How adorable is it? For the birthday outfit, it was really easy. 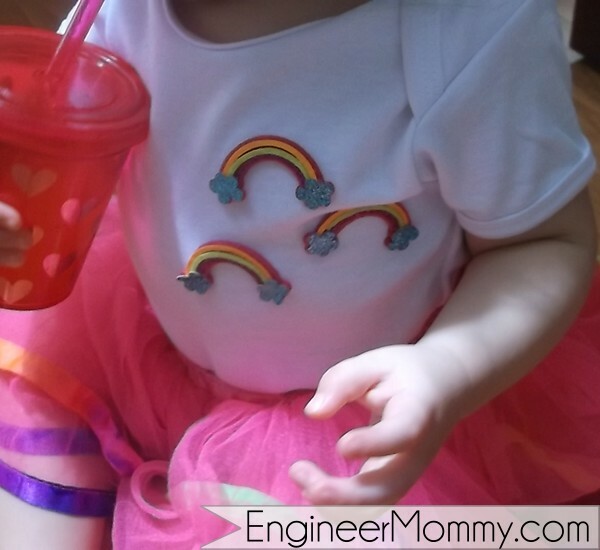 I already had on hand this multi-colored rainbow tutu. I picked up from Hobby Lobby a plain white onesie and some rainbow iron-on decorations, heated up the iron, and went to town! It looks perfect in this scene! Solar panels have come a long way!